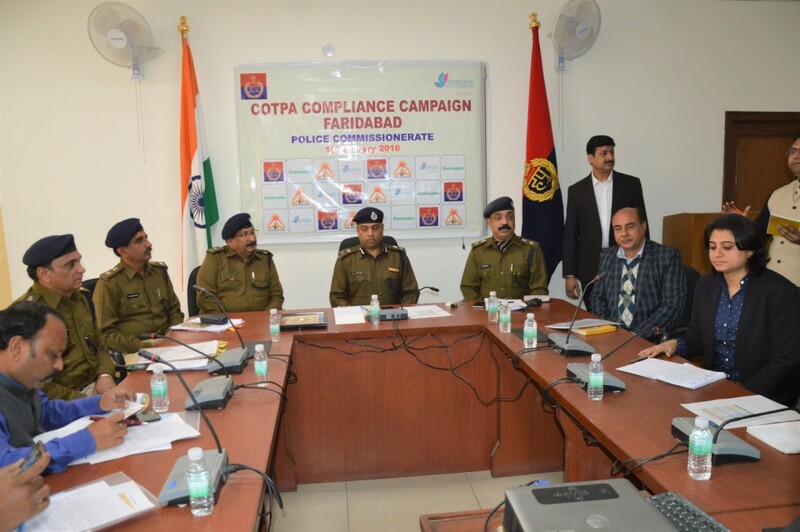 During December 2017 the Faridabad Police cracked down on smoking in public places by fining a record 2338 people violating COTPA (The Cigarettes and Other Tobacco Products Act, 2003) in Faridabad. This was done in 2 drives during the month of December ordered by the Commissioner of Police, Dr. Hanif Qureshi. 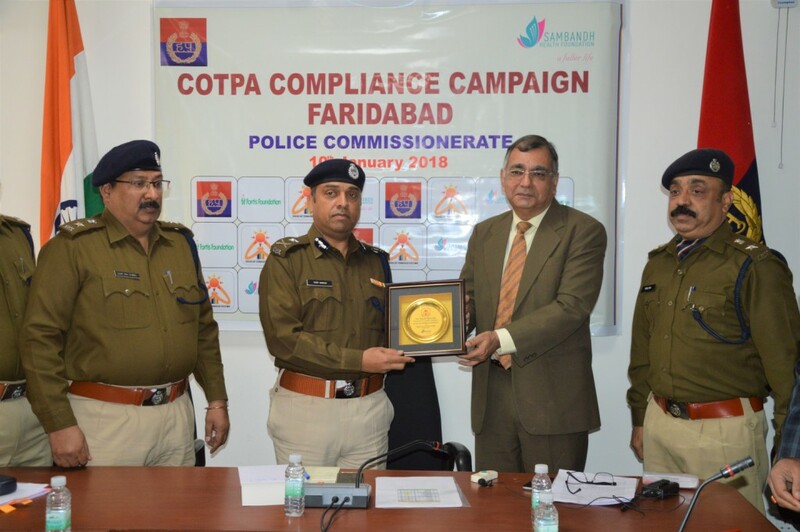 The Faridabad Police Commissioner had launched the campaign to enforce COTPA about a year back. Since then all the 19 police stations of Faridabad had been sensitized and trained with help of Sambandh Health Foundation. This campaign is supported by Fortis Foundation in Haryana. Many awareness drives were conducted as well as low-level challaning has been done in this year. Total number of COTPA violations in the last one year is 3163. Police Commissioner, Dr Hanif Qureshi observed that the purpose of enforcement is not to fine violators, it is to ensure that there is compliance of the law. The people who use tobacco in public endanger those who do not, especially children. For the better health of the people of Faridabad strict enforcement of COTPA is necessary. Sanjay Seth, Trustee, Sambandh Health Foundation presented memento to Dr Hanif Qureshi for the leadership in this campaign. Balabgarh city, Saran West, Sarai Khwaja Police stations which did exceptionally well were also acknowledged. COTPA (The Cigarettes and Other Tobacco Products Act, 2003) prohibits smoking in public places, direct/indirect advertising, sale to/by minors, sale within 100 yards of schools and mandates pictorial warnings on all tobacco packs. The Commissioner of Police, added that in spite of adequate warnings the violations were continuing and we decided on conducting drives. These have been successful and much appreciated by citizens and parents of Faridabad. He stated that we will now continue such drives to make it Tobacco Free Faridabad as a model district. Dr Somil Rastogi, of Sambandh Health Foundation who is in charge of the Fortis Foundation–Sambandh Tobacco Free Haryana Campaign said that 19.7% of people in Haryana smoke, either bidi or cigarettes, but the health of the other 80.3% is impacted. 10% of the estimated 28,000 people who die every year in Haryana due to smoking have never smoked themselves. The intensive campaigning by Faridabad Police has been well received by the citizens. H. S. Malik, Chairman of FMS School in Sector 31 said Police are doing a great job as tobacco vendors outside schools entice children to try tobacco products making them addicts and destroying their lives. Only the Police can stop these vendors. Anil Behl, President of the Rotary Club of Faridabad Midtown said that such campaigns will protect non-users and make for a healthier Faridabad. The Rotary fully supports this campaign and our members will be involved in creating awareness about COTPA in Faridabad. We will also distribute No smoking signages in the city. OLD AGE HOME:MISSING THEIR BELOVED CHILDREN-WHO ARE RESPONSIBLE? I happened to visit an old age home in my city, for attending the birthday celebration of my friends son. Though the celebrations went well and we thoroughly enjoyed the company of all the oldies here, but I felt something missing, leaving some unanswered questions in my mind, which I thought of penning down. A smile on their wrinkled faces and their lively charisma could hardly conceal the eternal pain in their last stages of life, despite the availability of materialistic comforts. They were still missing the company of their beloved children and loved ones, whom they loved from the bottom of their hearts and sacrificed a lot for their happiness. Some resided in the Apna Ghar, a home for the elderly by choice, while some were abandoned by their children, giving them no choice but to choose an old age home. Some came here out of despair while for some; circumstances played a vital role in bringing them here. It is rightly said that Parents are the bones on which Children cut their teeth. A lot has been talked about how tough parenting is and how much it demands, still the parent always selflessly contribute for their children. Parents consider them as their own piece of heart, and care so much for them, love them, caress them, cater to their needs and ensure their transformation to as a better human being and in this long process they eventually become old. Our life as a human being is marked by successive changes beginning from gestation and culminating into the death bed travelling through a life cycle phases like infancy, childhood, adolescence, adulthood and senescence. In this stage we gradually begin losing our vital mental physical capacities, which is the onset of ageing with time. Unlike earlier generations, when joint family culture was a mandate of the society, it has now become the relics of the past. Now, old and elderly are considered as a liability, which is possibly one of the biggest disadvantages of so called progressive modern society. Many questions strike our mind when we think upon it as a human being, Have we really become so mean and selfish Have we become so busy and self centered that we cannot invest even small portion of our time, love and money for those who had given their entire life, affection and money for us. Are we not abandoning our own creators During the visit, I took this opportunity to dig in to the lives of a few people there, and I was in a way happy that they chose to reside in the old age homes, rather than being subjected to the torture given by their own children. In the case of Blossom Singh Verma, fate played an important role. Her life turned topsy turvy after her husband was cheated in business and suffered huge loss. Marriage was never in my mind. I always wished to serve my parents who were ailing and wanted to be with them. Then my husband came with a proposal that even my parents can stay along with us so on the insistence of my family, I agreed to get married to him. I have a son and a daughter. Everything was running fine, we were well off and my husband had his business. Unfortunately, after we moved to Bhopal, my husband suffered a major loss in business. In that depression he just left us. I then suffered a paralytic stroke and my daughter became the leading lady of our house. She used to take care of her job and look after me and also bear the expenses of her younger brother, Blossom said. Then, she got an opportunity to work in Pune, which she was planning to resist because of my illness. My son is still pursuing his studies and I did not want to burden him more. So we decided that I move into an old-age home so that my children can first achieve their heights and then we will move in again together, she added. A poet, a violinist and a lawyer a member of the family who didnt wish to be named, hailed from a wealthy peasants family from Hoshangabad. He completed his studies from Itarsi and came to Bhopal to practice law. Talking about his story he says, I am a man of my words. I went to Nagpur University to do law and also learnt short hand typing. My love for music, bought me to All India Radio where I worked for several years. I have four children, two sons and two daughters. After I left my job, post an argument with the IAS in charge, I practised criminal law, he said. All was good till my sons got married. Both my daughter-in-laws started demanding my property being transferred in the names of my sons. However, I opined that it be evenly distributed among all my children including my daughters. A few years after this argument began, my wife fell ill and eventually passed away three years ago. On the very same day when we concluded her last rites, I was utterly shocked when my sons came and asked me to be live my own life separately. But I had no other option. This is how, I came here. I loved my wife, more than I loved myself. With my sons leaving me, and my wife leaving abode, I feel as though, my life had no meaning and I began questioning my existence. I was so appalled that I immersed all my trophies, medals and certificates in the holy Narmada river along with the ashes of my wife and here I am waiting for death. These experiences have shaken me deeply and has questioned : Does humanity still exists or it is slowly dying its death & a day will come when there will be no room for elders? There is a serious need for the society to have a relook into this issue from humanity perspective and it is the moral duty of everyone make the elders feel good in the last stages of their life, when they need us the most. Dr. Smita Gupta is MBA ,Phd (Management)Dr .Gupta served an Director at management Institute.Her interests include working for child Sexual Abuse,Bachpan Bachao Andolan.She is also active member of the Think-Tank Forward india Forum. 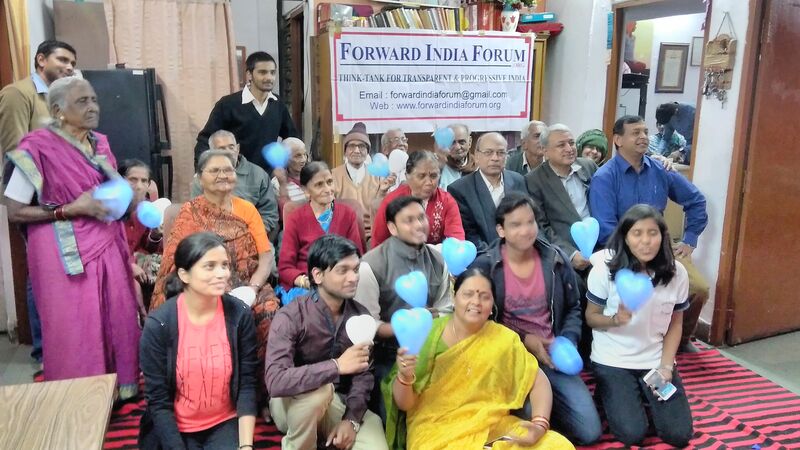 Metro Mirror, Forward India Forum & Deeshanjali members celebrated Valentine's Day at the ApnaGhar oldage Home. On this occassion the inmates cut the cake and Biscuit packets were distributed. Mrs. Madhuri Mishra who founded and managing the ApnaGhar introduced the inmates and some of the inmates recited poems and done Acting to propose the elder Woman. The inmates include the Judge and a doctor abandoned by their family. Mrs. Mishra told to MetroMirror, "we enjoy the company of elderly people and live as a big family. My husband, daughter and Bahu all help me to manage the ApnaGhar". 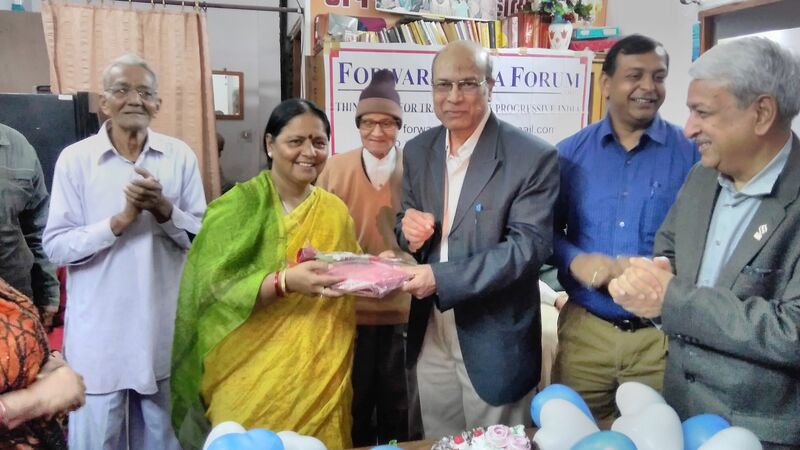 Dr. Anoop Swarup and Mr. Shiv Harsh Suhalka presented a shawl to Mrs. Mishra as a token of respect to her efforts to keep the inmates hapy and healthy. 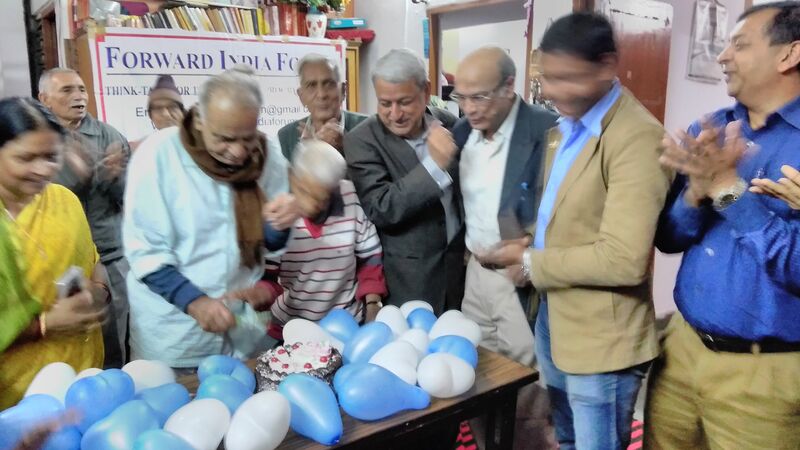 On this occasion Deeshanjali founder Mr. Vijay Patidar, Mr. Vikas Saxena and the Volunteers were present. The Prime Minister launched the Swachh Bharat Abhiyan on 2nd October, 2014, which among other things, also lays emphasis on elimination of insanitary latrines and mechanised cleaning of sewers and septic tanks. The Prohibition of Employment as Manual Scavengers and their Rehabilitation Act, 2013 (MS Act, 2013) prohibits insanitary latrines, employment as manual scavengers and hazardous cleaning of sewers and septic tanks. A Conference of State Ministers was held today on “Complete Elimination of Manual Scavenging through Effective Implementation of the Prohibition of Employment as Manual Scavengers and their Rehabilitation Act, 2013(MS Act, 2013)”. The Union Minister of Social Justice and Empowerment (SJ&E), Shri Thaawar Chand Gehlot presided over the Conference. During the Conference concerned State Ministers from nine States viz., Chhattisgarh, Gujarat, Haryana, Himachal Pradesh, Karnataka, Maharashtra, Odisha, Rajasthan and NCT of Delhi, participated. Senior officers of 21 States/UTs also attended the Conference. The Conference reviewed the action taken by the concerned States/UTs and Central Ministries for implementation of MS Act, 2013. State Ministers from nine States gave the status of action taken for implementation of the Act in their respective States and offered suggestions. Speaking on the occasion, Shri Gehlot exhorted the States for time-bound elimination of manual scavenging. He emphasised that the survey of insanitary latrines in urban and rural areas, as per the wider definition under the Act, need to be completed immediately. The manual scavengers servicing insanitary latrines should also be identified and assisted for their rehabilitation in alternative dignified occupations. Shri Gehlot also pointed out that the surveys of Manual Scavengers and insanitary latrines in many States have not been conducted properly. The concerned agencies need to conduct fresh house to house surveys by undertaking visits to individual houses keeping in view the definition of manual scavengers and insanitary latrines as per the MS Act, 2013. As per the mandate of Swacch Bharat Abhiyan a special drive need to be started to provide facilities to all the people. The Minister informed that the Government of India has already released one-time cash assistance of Rs. 40,000/- in the bank accounts of each of the 1359 manual scavengers, whose details have been provided to the National Safai Karamcharis Finance and Development Corporation by the States. He suggested States and UTs to forward proposal for comprehensive rehabilitations of Manual Scavengers already identified at the earliest, so that the Ministry could sanction rehabilitation package under SRMS though NSKFDC. He also emphasised that the hazards cleaning of sewers and septic tanks, prohibited under the Act, should be stopped forthwith. Chairman, National Commission for Scheduled Castes and Chairman, National Commission for Safai Karamcharis also attended the Conference. From the Ministry of SJ&E, Minister of State, Shri Krishan Pal Gurjar, Smt. Anita Agnihotri, Secretary and Shri Anoop Kumar Srivastava, Special Secretary besides senior officials also attended the Conference. Other participants included representatives of seven concerned Central Ministries, Non-Government Organisations associated with the elimination of manual scavenging, the apex Finance and Development Corporations for Scheduled Castes and Safai Karamcharis etc.